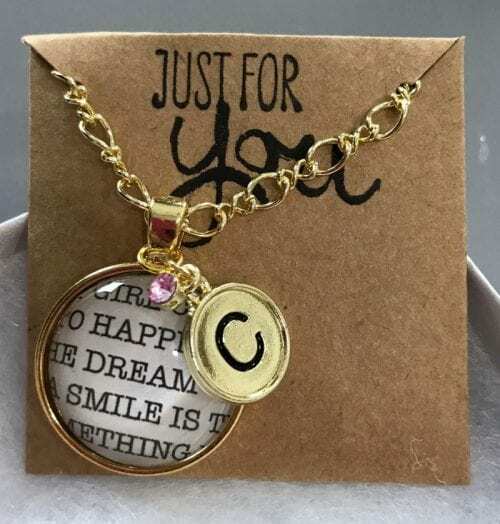 Create a Round Monogram Pendant Necklace. Beautiful handmade jewelry to give as a gift or keep for yourself. An easy DIY craft tutorial idea. Have you ever made your own jewelry? Making jewelry can be so much fun. Especially when you are making it for someone else! This Monogram Pendant Necklace is just one of the gifts I made for my Secret Sister. Begin by finding the pattern paper that you want to glue behind the glass tile. It really does need to be only a scrap because you need about 2 square inches of paper. With the Glossy Accents, squeeze a good blob of glue onto that flat side of the round glass tile. Push the tile down onto a scrap of paper. There will be extra glue that pushes out around the glass tile and that is ok. Wipe what you can, away with a QTip. Let dry. The glue doesn’t have to be completely dry to move on but should be dry enough where it won’t slide around the scrap of paper. With a pair of scissors cut around the glass tile. Apply double-sided tape to the back of the tile and trim if needed. Drop the tile into the pendant paying attention to where the top of the pendant is what direction you want the text or pattern on the paper facing. 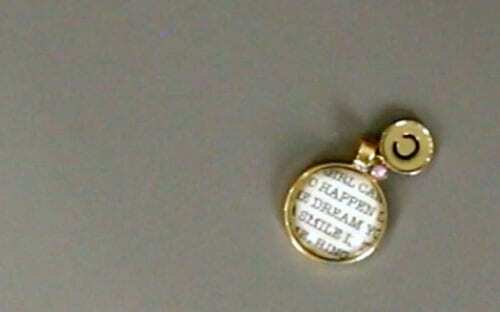 To add a little bit more to the pendant add a monogram charm for personalization. The charm I used had a clear rhinestone, but my secret sister loves pink, so I took a sharpie marker and colored the rhinestone pink. 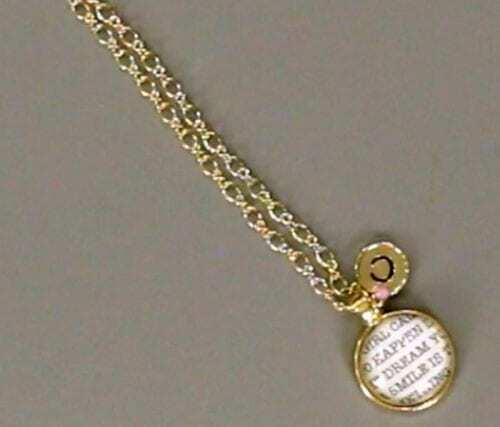 Using two pairs of jewelry pliers open a jump ring and attach the charm to the necklace. TIP: When opening and closing jump rings, open by twisting the wrist not pulling straight apart. Close using the same motion. Your jump ring will stay round using this method. 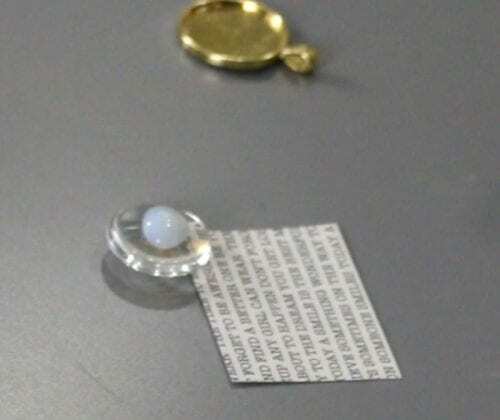 Slide the pendant onto a necklace, and the necklace is finished! I used some stamps and ink that I already had to dress up the necklace packaging. And it is ready to gift! I hope she likes it! What handmade gifts have you made for friends? Share and leave a comment below! 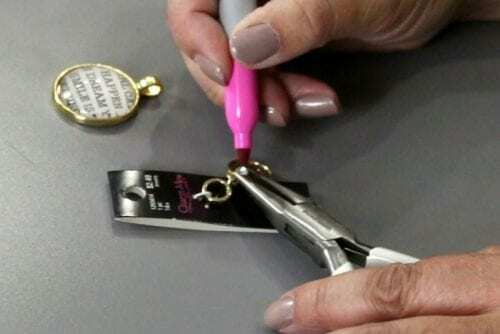 SAVE HOW TO MAKE A MONOGRAM PENDANT NECKLACE TO YOUR FAVORITE DIY JEWELRY PINTEREST BOARD! Thank you for the necklace video. I don’t usually care for the ideas I see, but yours caught my eye and I love it. 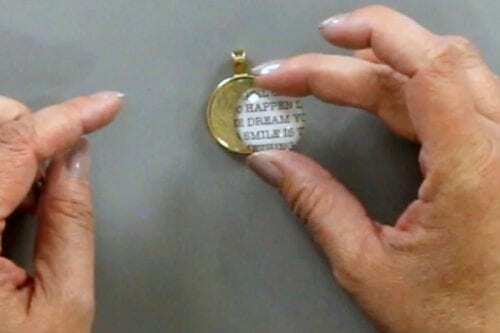 I would like to make several necklaces, and I really want to use the paper with the words on it but can’t seem to find it. Can you tell me where you purchased yours? I looked through the papers on Amazon and while there are some beautiful ones, none with the little words. Thank you again.